The web time clock provides a simple way for your team to punch in and out at work. You can run the web time clock from a desktop computer or a tablet. Similar to an "old school" time clock you can set up the web time clock as a kiosk at your business. Note: Not all organizations have the web time clock enabled. 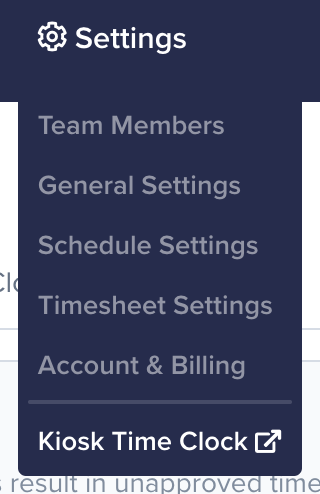 You can enable the web time clock and edit settings from the Settings => Timesheet Settings => Time Clock page. The web time clock is very simple to use. To access the public time clock, click on the Settings drop-down and click the Kiosk Time Clock link. Note: The time clock page is an encrypted public link that you can use on any web device. Bookmark this link and use it on whatever device you want to us as your time clock. You will be redirected to the time clock page that looks like the image below. If you see a red banner, this means you are still clocked in. You can logout by clicking on the banner. If you are not already clocked in, you will see a pop-up form like the one below. 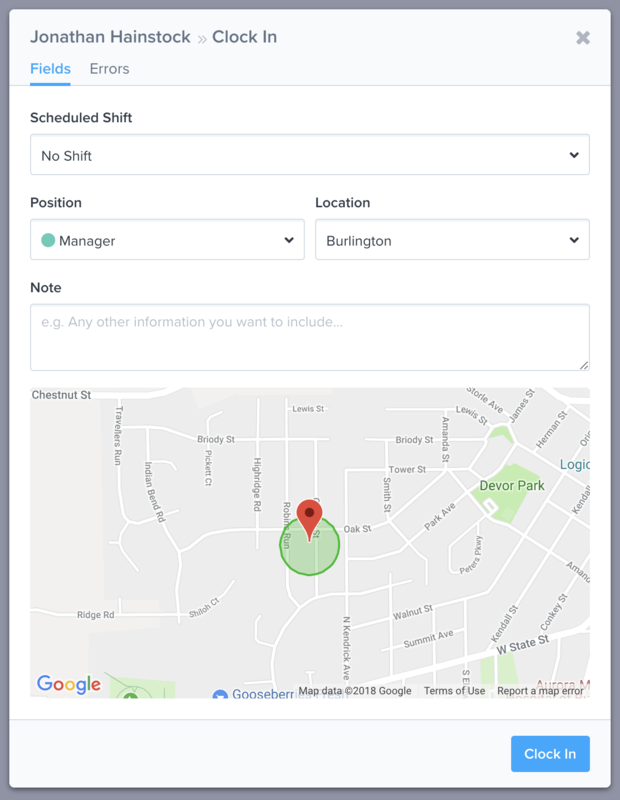 If you are scheduled for one or more shifts they will be displayed in this pop-up. 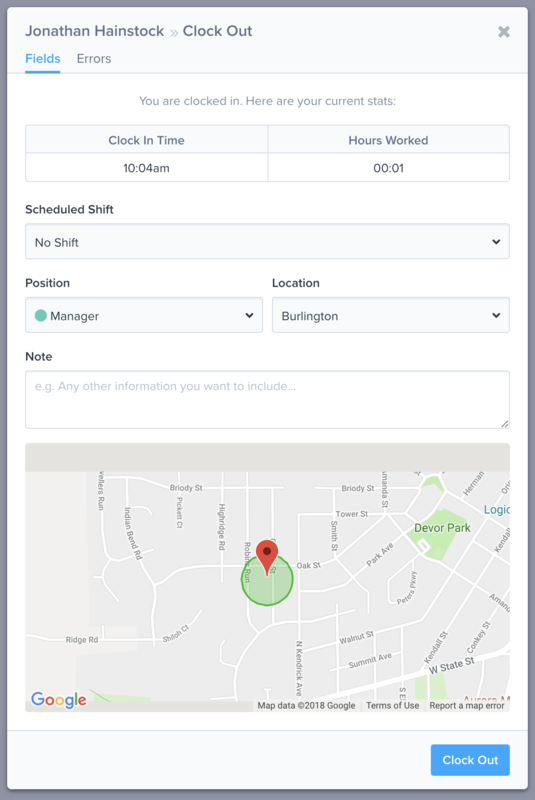 You can click on these shifts to select the position and location you are clocking into. Once you click the Clock In button, you will see a confirmation that you have been clocked in. 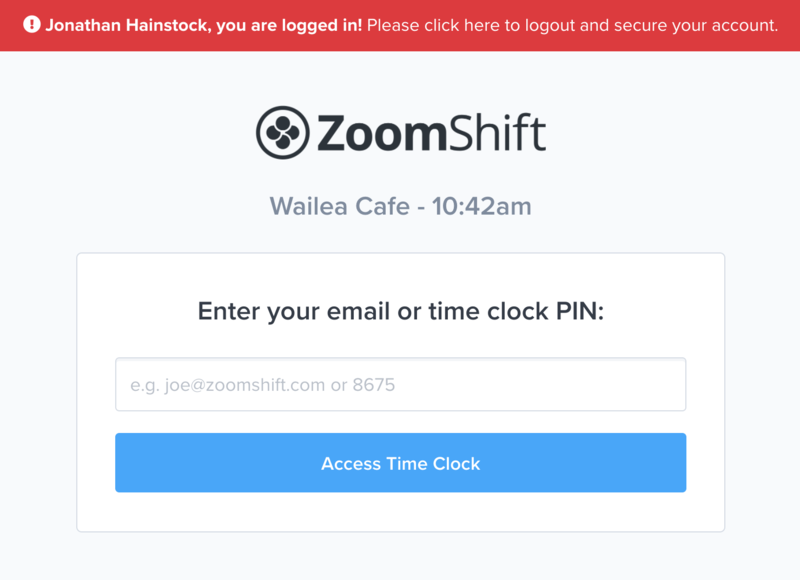 When you are done with your shift you just enter your email or Time Clock PIN again. The system will recognize that you are already clocked in and you will see a pop-up like the one below. In this pop-up, you can see some basic details about the shift you just worked. Once you click the Clock Out button you will see a confirmation that you have been clocked out. By default, the web time clock can be accessed from any computer. However, you may want to lock down the physical location(s) that your team can punch in/out from. This can be done by whitelisting specific IP addresses. If the whitelist IP addresses setting is enabled the time clock can only be used from IP addresses that are defined in your settings.